As with how so much is learned in this age of electronic communications, I received via email last week the news that journalist Harry Kazue Honda had died. He was 93. Ironically, as I learned from his daughter, Patty Arra, the last communication I received from Harry was also an email, sent just hours before he died July 3. He included me among a few folks in a short note commenting on the latest news from his place of employment for most of his adult life, the Pacific Citizen newspaper. Published by the JACL, Pacific Citizen was where I got my start in print journalism. Harry was its general manager during my time there, having served as its editor prior to that. His title in recent years was editor emeritus. He had a hand in hiring me as one of the paper’s two assistant editors. That I’m writing this column for The Rafu Shimpo in 2013 can be traced back, indirectly, to Harry hiring me at the P.C. in 1987 and opening the door to me becoming a journalist serving this community. But I’m not alone in that regard, as Rafu staffers Gwen Muranaka and J.K. Yamamoto also both spent early years of their careers working with Harry at that paper. It’s no overstatement to say that in the world of Japanese American community journalism, Harry Honda cast a large shadow due to his amazing longevity and steadfast association with Pacific Citizen, more than six decades. 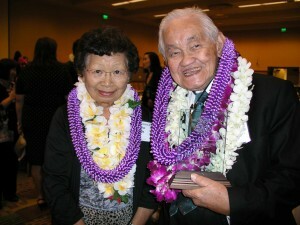 With his passing we have lost a walking, talking encyclopedia of events, facts, back stories, people and places important to not just the JACL and the Japanese American community, but to the greater Japanese Diaspora, since Harry was also a supporter of PANA, the Pan American Nikkei Association. But Harry was also a friend to other Asian American journalists, even before there was such a thing as the Asian American Journalists Association. When journalist K.W. Lee started Koreatown Weekly in 1979, the first English-language Korean American community newspaper, he would drive down to L.A. from Sacramento to use the P.C.’s production capabilities on the weekends. That was due to Harry’s largesse. (Not only was this pre-AAJA, this was before the days of desktop publishing using personal computers, which would have made K.W.’s quest, with assistants Randy Hagihara and Steve Chanecka so much easier and successful.) “He was an all-American newspaperman. I respect him,” said K.W. He added that Harry typified and personified the generosity and humility of the Nisei generation. I agree. 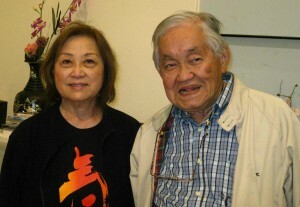 Harry Honda with Iku Kiriyama of the Japanese American Historical Society of Southern California at a “Save the Rafu” meeting in 2010. Harry was also a native son of Los Angeles, as well as a husband, father and grandfather to four grandchildren. He also served his nation, having been drafted into the Army on Oct. 7, 1941 and serving until he was honorably discharged on Dec. 24, 1945, earning the rank of technical sergeant. All this as his family was incarcerated in Rohwer, Ark. Later, Harry would attend and graduate from Loyola University of Los Angeles, or Loyola Marymount University as it was then known. His journalism career spanned all the technological changes that affected the trade over the decades, from printed page to tablet computer. Harry’s writing even appeared in the now-dormant NikkeiNation.net website. I most recently wrote about Harry in an article for Pacific Citizen last year, when I was called back to help them out between full-time editors. I chatted with him as I covered the Pacific Southwest District’s annual dinner, at which he was honored with a “living legend” award. I also referenced Harry nine months ago in my Oct. 11, 2012 ITNS column. During my stint at P.C., the hard-fought Civil Liberties Act of 1988 was enacted by President Ronald Reagan in August during the JACL’s National Convention, held in Seattle. I was there to cover it for the P.C., and Harry was also in attendance. At some point during the convention, an announcement was made: Reagan was going to sign the bill into law! To have such news break during a JACL confab was momentous indeed. Travel arrangements needed to be made post haste to get people like JACL President Harry Kajihara and other JACL folks to Washington, D.C. for the signing ceremony. I really wanted to go cover it and be there when it happened. As a P.C. editorial staffer, not only was I entitled to go, it was my job. But I also knew it wasn’t my story so much as it was Harry’s story, in that it was his generation that lived through an era of discrimination and abrogated civil rights. Even though he was the G.M. and no longer an editorial staffer, he deserved to be there, not me. 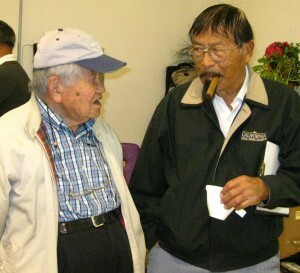 Harry Honda with Rafu columnist George Yoshinaga at a “Save the Rafu” meeting in 2010. After the announcement was made, amid the hubbub I remember standing up and making a request on behalf of the Pacific Citizen, that in addition to national JACL officers getting travel arrangements for the trip to Washington, that a representative from the paper also be paid for to provide news coverage to the paper’s readers — and that the person to represent Pacific Citizen be Harry Honda. Harry went and it’s his byline on the Pacific Citizen’s coverage of the greatest legal triumph in American history by a group of aggrieved citizens seeking redress, who learned the rules of the game, “fought city hall” and won justice, fair and square. All told, I worked with Harry for about three years at P.C. But those were very formative years for me, and I learned a lot from him and the general on-the-job training that comes with working for a small publication. But I’d like to think that I also influenced him. For example, during the time I was there, Pacific Citizen used, if memory serves, a CRTronic 360 phototypesetter that would output long strips of type on photographic paper that need to be dried, waxed, cut and then attached to boards, which would then be taken to the printer, where they’d be photographed. The negatives would then be used to make printing plates from which the paper was printed. The screen on the typesetter was tiny and dark with green lettering. A user would have to put in proper codes to determine the typeface, type size, column width and so on. When we needed photos to be turned into halftones, we’d have to take them to a guy in Santa Fe Springs named Vern who had a big camera in his garage that would be used to shoot the photos so they could become halftones. Most of the time Harry served as the courier for these tasks since it was sort of on his way from the office, then at 941 E. Third St., and his home. Even though the phototypesetter was still relatively new (I think it got paid off during the time I was there), I thought the production process was tedious, antiquated, expensive and inefficient. We’d get columns and articles faxed to us (even the fax machine seemed ancient), after which we’d have to retype it on a separate terminal, save it to a 5¼-inch floppy disk and then bring the floppy to the phototypesetter. I, however, had some different ideas on how to better produce the paper. I had been reading about desktop publishing and had seen some demonstrations of how it worked. The still-new Apple Macintosh computer, with its revolutionary WYSIWYG (what you see is what you get) display dispensed with arcane codes. Scanners could be used to process photos, which could then be placed into a page layout program. You could also scan a typewritten page and use optical character recognition software to process something that was faxed in. (This was still before the advent an even easier method, namely attaching a file to an email.) One person could write, copy edit and paginate on a system of networked computers. To me, this was the way to go. But when I brought it up to Harry, he bluntly told me, “You can’t put out a newspaper on a Macintosh.” I disagreed with him, of course, but P.C. was always hurting for money and there was no urgency to switch platforms to something new and better from another technology that was no doubt superior to what they had before the CRTronic 360. After I left the P.C. in 1990, it moved down the street to the Neptune Building (Rafu’s present location) and invested in Macintosh computers. I can’t remember who it was, but someone told me that after the new computers were purchased, you couldn’t get Harry off the Mac! Now, in 2013, Pacific Citizen (and many other publications) still uses Macintoshes, with all the advantages they confer. That too is part of Harry’s legacy to the present day. From what I can tell, he embraced computers as a means of communication wholeheartedly. According to Patty, his fatal heart attack came after lunch. He had been working at his computer, of course. That last email I received from Harry was sent just hours before he died. It had to do with the goings on at Pacific Citizen. It was commentary on an email from JACL National that he forwarded to several others and me. Coming from someone as circumspect and polite as Harry, I interpreted that as hard criticism of how long — just under a year — it took JACL to finally, finally pick a new editor and nine months from when Allison became interim editor to when she was given the nod. But it is solace that someone who had dedicated his professional adult life to Pacific Citizen was able to pass on with the knowledge that the paper — his paper — would be in good hands. Rest in peace, Harry. Condolences to your widow and daughter. One final thought: The Asian American Journalists Association is having its convention in New York, Aug. 21-24. Over the years it has honored journalists Bill Hosokawa, Jimmy Omura and K.W. Lee. They all had more famous (and infamous) careers than Harry Honda did. It would nevertheless be nice — nay, it would be fitting — for AAJA to make mention of Harry’s passing and maybe honor him with a few words. Maybe someone in the group’s hierarchy will read this and make it happen. 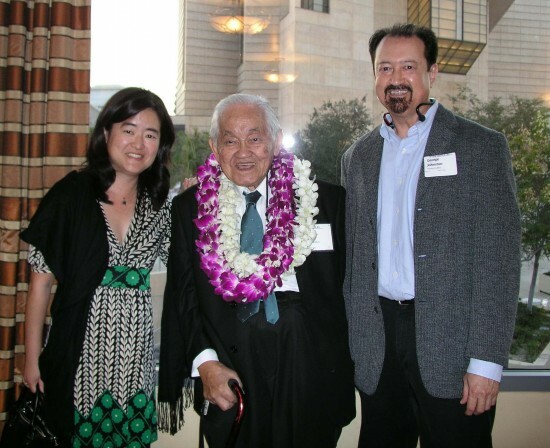 Harry Honda with Rafu English Editor Gwen Muranaka and yours truly at last year’s PSW JACL awards dinner. Days later, the news broke that “ETD” co-star Jim Kelly died June 29. It was just a bit ironic, because one of the things my friend Vic Cook (who got me into the Warner Bros. screening of “ETD”) and I discussed was the absence of Kelly at the screening. After all, John Saxon was there. Kelly’s absence was curious to say the least. Well, it turned out that Kelly, 67, had been fighting cancer, so even if he had been invited, he probably would have been unable to attend. Jim Kelly was not a great actor. But he was a great screen presence. And, it turned out, he did more than martial arts. He was also a pretty good tennis player, as I was to later learn. I actually met Jim Kelly. It was brief but memorable. I was returning to Boulder, Colo., after a trip to Japan to visit my parents. I stopped in Los Angeles for a couple days to visit my sister, June. She had picked me up at LAX, and we went to lunch nearby. I don’t remember the restaurant, but she says it was the Good Earth. While we were at our table, I noticed a man in another part of the restaurant, standing and chatting with someone. He looked like he could have been a college grad student. He was wearing a T-shirt and shiny sweatpants. In other words, he looked like a tennis player. It looked like Jim Kelly, but with shorter hair than his early ’70s afro. I told June, “That guy over there looks like Jim Kelly from ‘Enter the Dragon!’” She said, “This is L.A. If you see someone who looks famous, it’s probably that person.” I was a bit hesitant but she urged me to talk with him. So, I worked up the courage and introduced myself and asked if he was Jim Kelly. It was. He was friendly and happy to be recognized. We made small talk and then went our separate ways. Didn’t take a picture. Didn’t get an autograph. But I met Jim Kelly, a memorable part of a much-admired movie. And now, like Bruce Lee, he’s gone too.